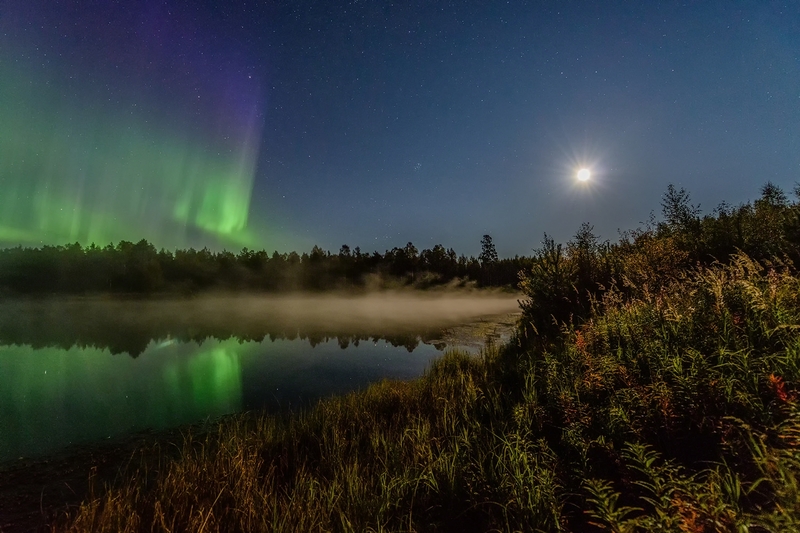 From September through mid-April auroras can be seen relatively often around Oulu. 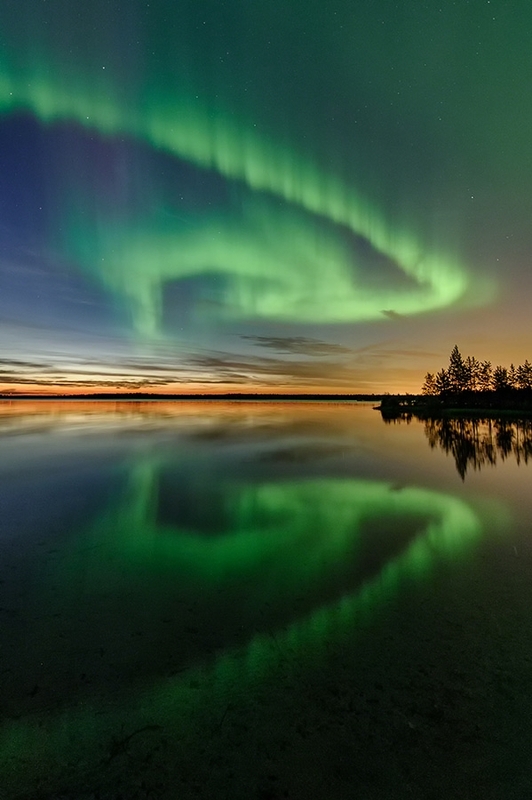 In autumn Northern lights can produce stunning reflections in the water. 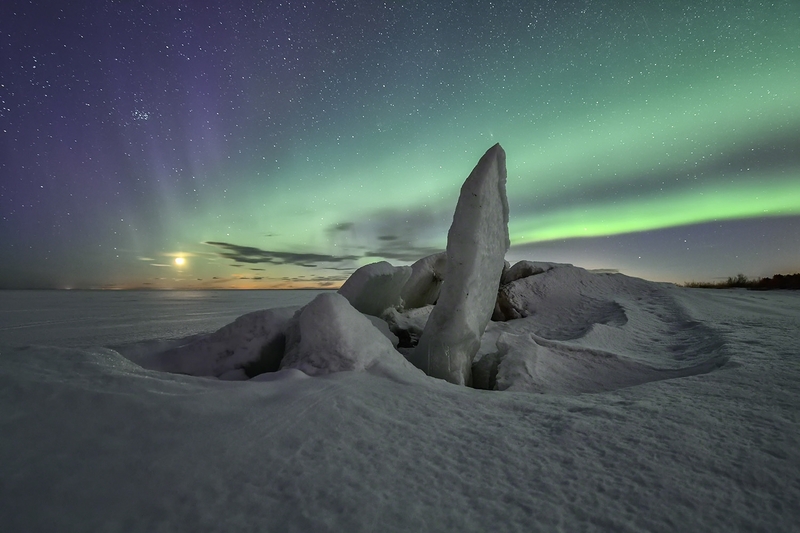 With favorable conditions during winter, it is possible to view the magic lights on the frozen Baltic Sea, a very unique experience. This 4-hour tour starts usually in the city center of Oulu at 20:00 hrs when we will head out into nature to be searching for the aurora borealis. You will get a lot of background information regarding the Northern lights as well as tips and tricks to get the best out of your camera during the night. Our van has a parking heater which warms up the interior space. If you feel cold, you can warm up in the van anytime. Nevertheless, it is important to wear proper clothing against the cold. As always and everywhere, the weather is an unknown. For this tour, there are no fixed dates available. Please use the Book here – button to inquire possible dates. 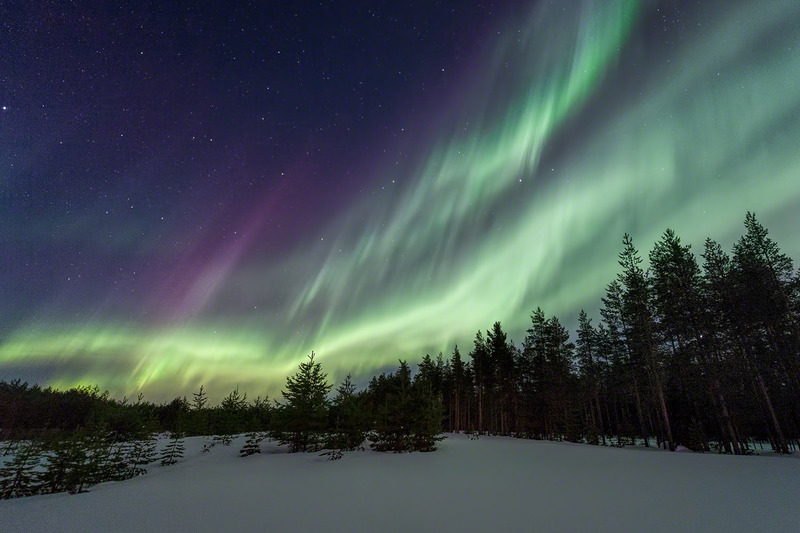 The aurora season last from September through mid-April. From mid April until the end of August the nights are unfortunately too bright. Usually 2-6 participants, for inquiries for larger groups please use the registration form. This tour is open to all skill levels, from beginners to professionals. Of course it is also possible to go on this tour without a camera. This tour does not require any special fitness level. In winter, we will do short walks through the snow. For inquiries regarding larger groups please use the registration form. For inquiries regarding larger groups or 1-on-1, please use the registration form. Usually, we will meet at 20:00 hrs in the city center of Oulu. If the aurora activity is low, we will have an introduction first. In case the aurora is going strong already, we will leave at once. Then we will leave the city lights behind us and drive usually about 30 minutes to a spot where it will be dark enough to see auroras and the starry sky. Depending on the weather situation we might have a longer drives. Once at the location you will get tips and help setting up your camera for aurora photography. You will also have the chance to look over the shoulder to your guide’s camera and get first-hand insights. To keep you warm, you will get a hot drink and snacks. The van has a parking heater which warms up the interior space. If you feel cold, you can warm up in the van anytime. Usually we head back to Oulu around 23:30 hrs. If there is a great aurora show, we can stay longer. Let’s enjoy the dance of the lights and shoot some fantastic photos together! Oulu lies at the Bothnian Bay, the mostnorthern part of the Baltic Sea. 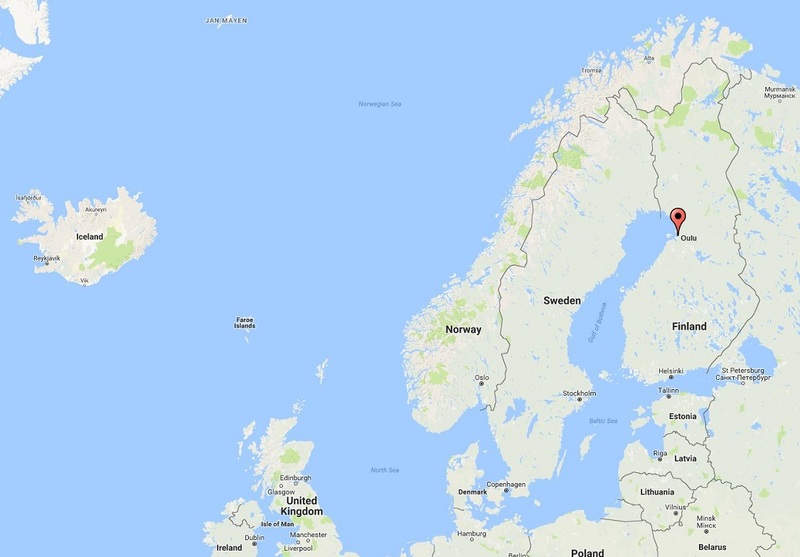 The city is located about 540km North of Helsinki and just 160km South of the Arctic Circle. Here live about 200,000 people and the annual average temperature is just below +3C (37F). The airport in Oulunsalo (OUL) is just 12km away from the city center of Oulu and offers several daily flights to and from Helsinki. Regarding accomodations, here a selection from TripAdvisor. Essential for night and aurora photography. The tripod will minimize camera shaking. Handheld photos in darkness will not be sharp. To adjust settings comfortably, the tripod should be nearly your height. Any camera with the option of manual focus and a complete manual mode which allows you to adjust aperture, exposure time and ISO separately. Most suitable are dSLR cameras as well as newer mirrorless cameras. Pocket cameras with a zoom might be ok in some cases, you can contact me for that when booking. For night and aurora photography you should bring a fast lens (meaning wide aperture, with a small f-number like f/2.8 or better) to make the most of the available light. Lenses with f/4.0 are doing fine also but you might have to crank up the ISO. 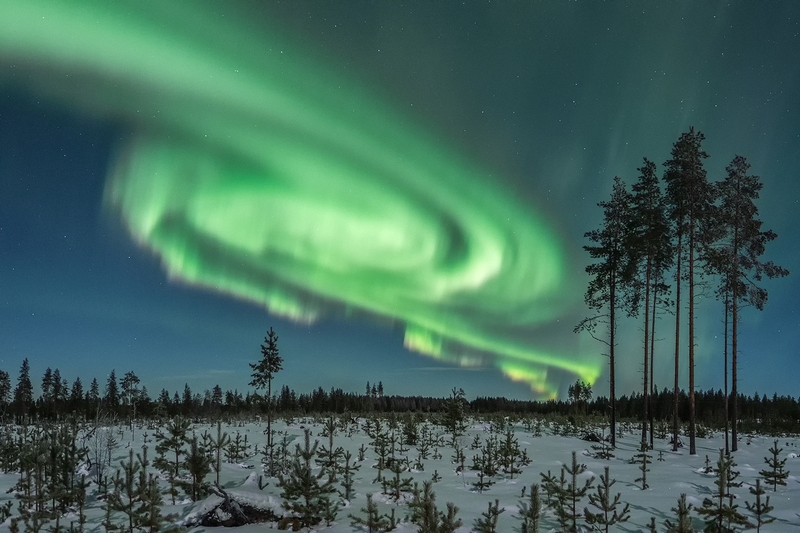 Auroras often stretch all across the sky. To capture a big part of it, you want to have a wide-angle lens (24mm or wider). If you bring a compact camera, make sure the lens is f/2.8. Again, you can contact me for that when booking. Use during night photography or long exposures. The remote allows you to take photos without touching the camera. Will be important during the night. If you can get a head lamp with a red light option, it will be helpful. In cold weather your batteries will discharge quite fast. It will be important to have at least one extra batteries with you, fully charged. 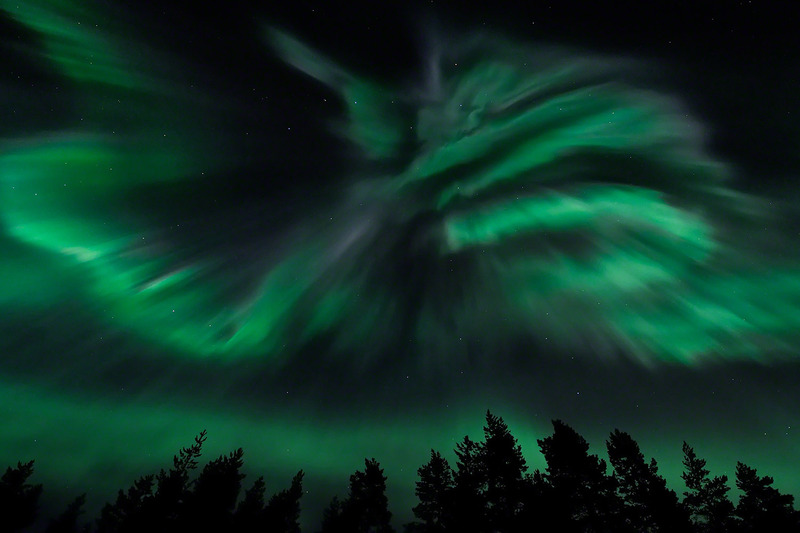 To read more about aurora photography, check out my aurora guide ‘Fox Fires’, part 4. Make sure you have the right clothing. In autumn nights the temperature will often be below 0C (32F). In winter it can be as cold as -15…-25 (5….-13F). Best is a woolen layer. For example, merino wool is excellent. Another woolen layer and some fleece layers usually work well. Top your layers off with a winter jacket, best for them will be windproof. They will be essential as your toes and fingers will be one of the biggest challenges to keep warm. Hand and toe warmers can easily be purchased online. Good to have: Thin gloves to operate the camera in the cold. These thin gloves can be worn under thick ones. Make sure to properly protect your head and ears against the cold. A balaclava helps to keep your face warm, especially your nose and cheeks. In case the guide would fall sick, the tour will have to be cancelled and you will receive the full refund. If you have questions related to this tour, your photo gear or anything else, please use the registration form.